Around the Corners: Where's the Pool? What a great weekend! On Saturday, Amy and kidZone took 23 to Green Meadows Farm. They had a blast catching chickens, riding ponys and petting farm animals. There are some pictures on the members page of the Cornerstone site. Then Sunday night a great couple, Art and Maureen, were baptized into the membership of Cornerstone. We have been claiming them for a long time and they are always a blessing when they are in the country, but they have a passion for God and want to be a more active part of the church. It is their goal to spend more time in the states serving in any capacity they are needed. That attitude does this pastor's heart well. There are some pictures on the members page as well. 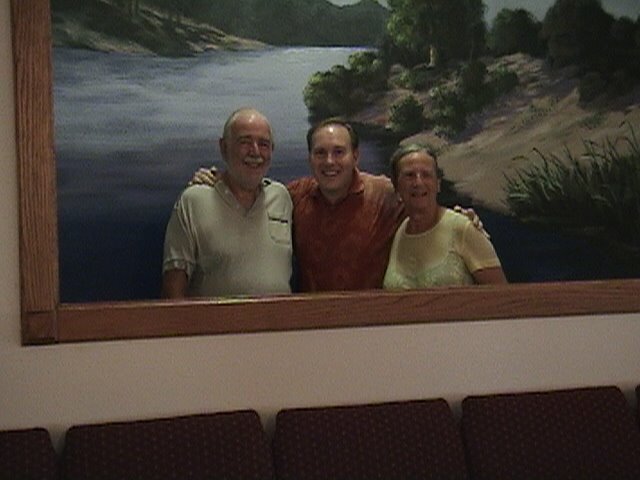 Props go to our friends down at Four Corners Baptist Church for allowing us to borrow their baptistery. It was the first time since beginning the church that we have used a "real" baptistery. This only became evident to me when we arrived at the church and Andrew (my 4 year old) said "Where's the pool?" He thought having a big tub in church was pretty cool. In some ways I still find myself asking "Where's the pool?"